South Padre Island stretches along 35 miles of the Texas Gulf Coast. 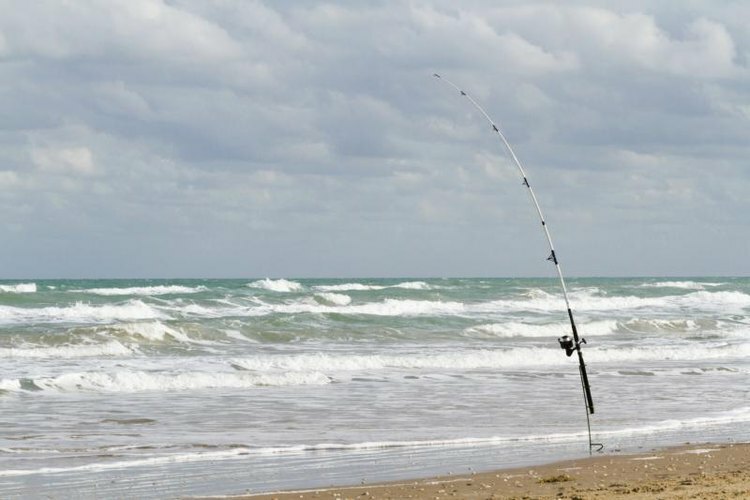 Overlooking the Gulf of Mexico at the southernmost tip of the Lone Star State, South Padre Island is one of the most reliably productive saltwater fishing spots in Texas. Two jetties -- one at either end of the long, narrow island -- provide access for shore fishermen to cast into the surf for dozens of fish species, including game fish that are seldom found elsewhere along the Texas coastline. The jetty at the south end of South Padre Island is by far the more easily accessible of the two. From the mainland city of Port Isabel, head east on State Highway 100, also known as the Queen Isabella Causeway, and then turn right onto State Park Road 100. The jetty is located in Isla Blanca Park, about 5 miles from Port Isabel. To get to the northern jetty, turn left instead of right on State Park Road 100, and head up the coast for about 35 miles. The road ends after a few miles, so you'll have to drive on the beach most of the way. The trip to the north jetty is advisable only with four-wheel drive and during fair weather. Fishing starts early on South Padre Island, and you can catch black drum, redfish and sheepshead as early as January. These species are available year-round, but prime fishing takes place from the jetties between February and April. Try casting silver or gold spoons from the jetties, or use live baits on bottom rigs. Small crabs are among the most effective live baits, but minnows and live shrimp can also catch fish. Fishing for seatrout begins to pick up as spring progresses, with peak action available in June. Try live minnows or minnow-imitating lures like jigs, plugs and spoons for seatrout. The best fishing usually takes place during a rising or falling tide. Once waters warm up past the 70 degrees Fahrenheit mark, fishing heats up for Spanish mackerel, king mackerel, pompano and several other species. Mackerel often strike large, flashy spoons, while pompano prefer smaller jigs. Cobia, mangrove snapper, ladyfish and flounder are also available. Because of their southern location, the South Padre Island jetties offer opportunities to catch fish species that are extremely rare elsewhere along the coast. Big tarpon may strike large minnows and plugs in summer and fall, and anglers often catch snook on medium-sized minnow imitations. The waters around South Padre Island support the only reliable snook population in the United States outside of Florida. A few redfish and seatrout hang around through summer, and these fish reappear in greater numbers with the arrival of fall. Easy access makes the southern jetty the more popular fishing spot on South Padre Island, but the more remote northern jetty often rewards those willing to make the trip with better fishing. A current Texas saltwater fishing license is required to fish anywhere on South Padre Island. Licenses are available through the Texas Parks and Wildlife website as well as tackle shops and other retailers across the state. License retailers on South Padre Island include Island Market on Padre Boulevard and Island outfitters on West Swordfish Street. Statewide saltwater fishing seasons, limits and other regulations are in effect, and a complete guide to current regulations is available through the Texas Parks and Wildlife website and wherever fishing licenses are sold.